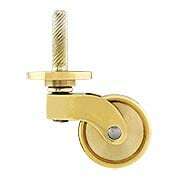 This versatile Stem Caster with White Porcelain Wheel (1-Inch Diameter) brings vintage style to any decor, and is suited for antique and reproduction chairs, cabinets, and sofas. 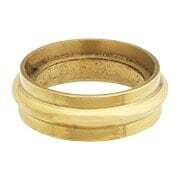 It features solid-brass construction and is left unlacquered to allow for graceful aging, just like the antique originals. 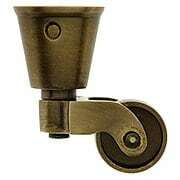 This versatile stem caster brings vintage style to any décor, and is suited for antique and reproduction chairs, cabinets, and sofas. 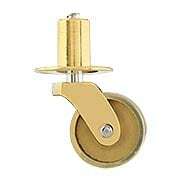 It features solid-brass construction, a one-inch diameter porcelain wheel, and our exclusive living antique patina. 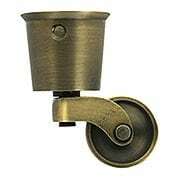 This hard-to-find stem caster brings vintage style to any décor, and is suited for smaller tables and other lightweight furniture. 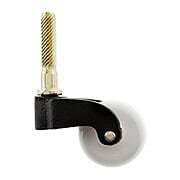 It features sturdy, iron construction, a 1 1/8” porcelain wheel, and a textured surface with a black-painted finish. 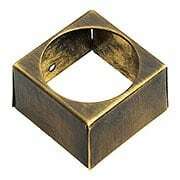 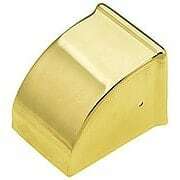 Give your stem-and-plate caster added flair with this solid-brass, decorative caster ring. 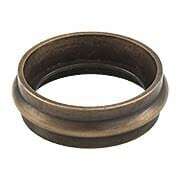 Presented in our exclusive Antique-by-Hand finish, it ages gracefully over time into a beautiful natural patina. 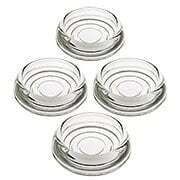 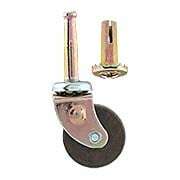 With a 1 3/16" inside diameter, it is designed to fit a 1 1/8" caster plate. 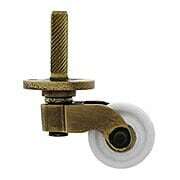 Our versatile Stem Caster brings vintage style to any decor. 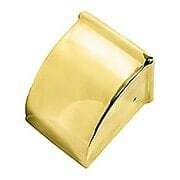 Suited for antique and reproduction chairs and cabinets, it features solid-brass construction and 1-inch wheel. 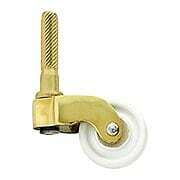 This versatile Stem-and-Plate Caster is suited for use on a wide variety of furniture including dressers, chairs, and cabinets. 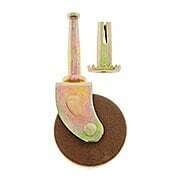 It features solid-brass construction, a 1 1/4-inch diameter brass wheel, and your choice of two popular finish options. 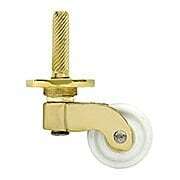 This versatile Pivot-and-Plate Caster is suited for use on a wide variety of furniture including dressers, chairs, and cabinets. 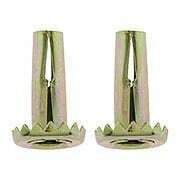 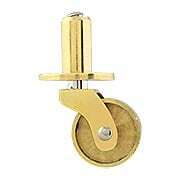 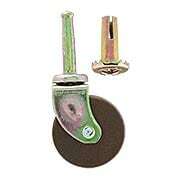 It features solid-brass construction, a 3/4-inch diameter brass wheel, and your choice of two popular finish options. 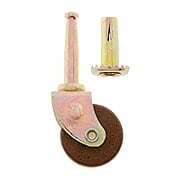 This versatile Pivot-and-Plate Caster is suited for use on a wide variety of furniture including dressers, chairs, and cabinets. 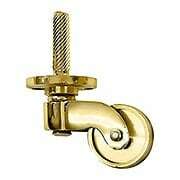 It features solid-brass construction, a 1 -inch diameter brass wheel, and your choice of two popular finish options. 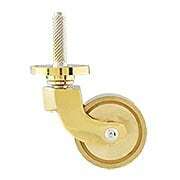 Our versatile Stem-and-Plate Caster is suited for a wide variety of furniture including dressers, chairs, and cabinets. 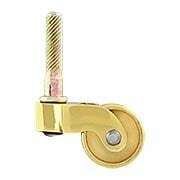 It features solid-brass construction, a 1 3/8-inch diameter brass wheel, and your choice of two popular finish options. 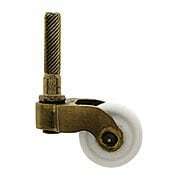 Our Ball Bearing Grip-Neck Caster with 1 1/4" Dark Hardwood Wheel adds a vintage touch to your decor. 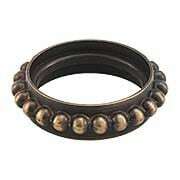 Its ball-bearing design allows you to move heavy items with ease, while a steel assembly ensures long-lasting wear. 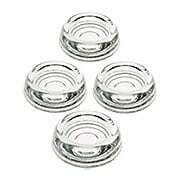 Suited for a variety of furniture styles including tables, cabinets, and chairs. 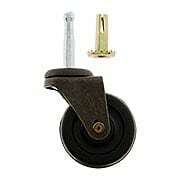 Our Ball Bearing Grip-Neck Caster with 1 5/8" Dark Hardwood Wheel adds a vintage touch to your decor. 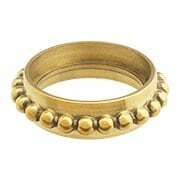 Its ball-bearing design allows you to move heavy items with ease, while a steel assembly ensures long-lasting wear. 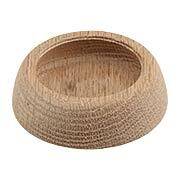 Suited for a variety of furniture styles including tables, cabinets, and chairs.